Inquiry-based learning and collaboration are two of the fundamental non-negotiable elements of planning, teaching and assessing within the International Baccalaureate Middle Years Programme. MYP From Principles into practice and each subject guide provide the philosophical and well-researched reasons for the push for inquiry-based learning and collaboration. 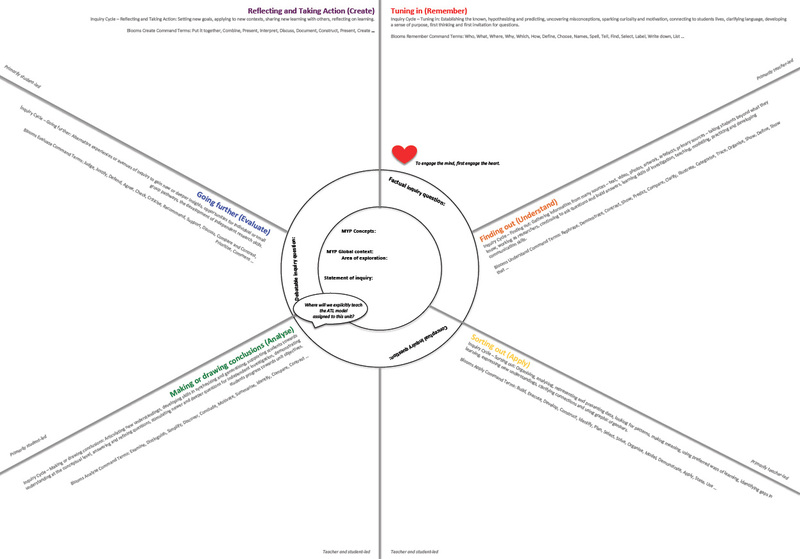 To provide a foundational scaffold for our colleagues to work from we adopted the Kath Murdoch inquiry cycle and linked this with Blooms Taxonomy verbs to develop a collaborative circular planning tool for all teachers to use when planning their MYP inquiry units. This provides a common language for how to plan for inquiry and a foundation for further research into inquiry methodologies that suit individual teachers teaching styles. The ultimate purpose of the circular scribble planning tool is to promote visible learning and to model inquiry and thinking and skills to our students. The end goal being our students to develop as sell-regulated critical and creative thinkers who have the tools to engage in independent inquiry. 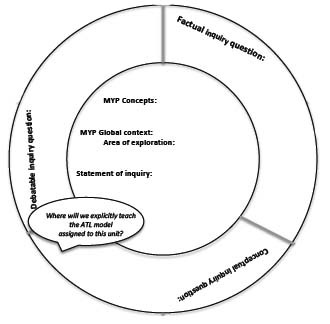 The first section of the inquiry cycle is Tuning in, where we respond to our factual inquiry question and seek to “hook” our students into the purpose of the learning within this inquiry unit. We seek to spark curiosity and begin a motivation for learning. When planning learning experiences for Tuning in the Blooms command terms for Remember are a guide for developing these learning experiences. continue to build teacher-student relationships – we can’t do the Blooms stuff without the Maslow stuff. Through a formative assessment learning experience ensure students have a developing understanding and response to our factual question before progressing to the next level of our inquiry cycle. how are we planning for students developing conceptual understanding? how is the global context area of exploration we have chosen woven throughout the learning experiences we have planned? are we providing opportunities for students to develop as independent and self-regulated learners? Something to keep in mind: as inquiry-based teachers we are facilitators of students learning and our goal is to develop self-regulated inquirers – let the students questions guide the learning, encourage them to write their own factual, conceptual and debatable questions, provide time for further exploration of the global context and encourage students to set their own learning goals. Be open-minded to the students questions and flexible in allowing students to lead the learning within this inquiry unit. This can be so very effective, here’s some reflective proof. The second section of the inquiry cycle is Finding out, where we continue to respond to the factual inquiry question and take the learning further. When planning learning experiences for Finding out the Blooms command terms for Understand are a guide for developing these learning experiences. plan for self-assessment learning experiences where students can reflect on their learning and their understanding of the factual inquiry question. Through a formative assessment learning experience ensure students have an accurate and clear understanding and response to our inquiry unit factual question before progressing to the next level of our inquiry cycle. Tuning in and finding out sections of the inquiry cycle tend to be primarily teacher-led, however, depending on how we collaboratively plan this can vary according to the needs and abilities of the students in our classes. The third section of the inquiry cycle is Sorting out. Our conceptual inquiry question(s) guide how we plan for inquiry within this section of our inquiry cycle. When planning learning experiences for Sorting out the Blooms command terms for Apply are a guide for developing these learning experiences. plan for self-assessment opportunities of applied knowledge and skills. Through a formative assessment learning experience ensure students have a developing and clear understanding and response to our conceptual question before progressing to the next level of our inquiry cycle. The fourth section of our inquiry cycle is Making or drawing conclusions where students engage in analysis. Our conceptual inquiry question(s) guide how we plan for inquiry within this section of our inquiry cycle. When planning learning experiences for Making or drawing conclusions the Blooms command terms for Analyse are a guide for developing these learning experiences. draw independent and collaborative conclusions to the statement of inquiry. Through a formative assessment learning experience ensure students have an accurate and clear understanding and response to our conceptual question before progressing to the next level of our inquiry cycle. Sorting out and Making or drawing conclusions sections of the inquiry cycle tend to be primarily shared teacher-student led, however, depending on how we collaboratively plan this can vary according to the needs and abilities of the students in our classes. The fifth section of our inquiry cycle is Going further where students begin to evaluate their learning. Our debatable inquiry question guides how we plan for inquiry within this section of our inquiry cycle. When planning learning experiences for Going further the Blooms command terms for Evaluate are a guide for developing these learning experiences. students to engage in debating activities where they have to defend and justify their response to the debatable question and our statement of inquiry. Through a formative assessment learning experience ensure students have a developing and clear understanding and response to our debatable question before progressing to the next level of our inquiry cycle. The final section of our inquiry cycle is Reflecting/Taking action where students independently and/or collaboratively reflect and create from their learning. Our debatable inquiry question guides how we plan for inquiry within this section of our inquiry cycle. When planning learning experiences for Reflecting/Taking action the Blooms command terms for Create are a guide for developing these learning experiences along with a variety of reflection models and tools. allow time for students to develop their metacognitive skills. Through a formative assessment learning experience ensure students have an accurate and clear understanding and response to our debatable question before concluding this unit and preparing for the next inquiry unit. Going further and Reflecting/Taking action sections of the inquiry cycle tend to be primarily student led, however, depending on how we collaboratively plan this can vary according to the needs and abilities of the students in our classes. Something it keep in mind: as an International Baccalaureate World School as well as a Lutheran School service is a very important element of the culture of our College. Within this section of the inquiry cycle encourage students to strive to be the learner profile attribute of caring through a service experience either at a local, national or global level, thus allowing them an opportunity to demonstrate their commitment to service – the mission statement of our College. Inquiry is dynamic and complex and requires that we as teachers take risks and continually strive to empower students to take responsibility for their learning. 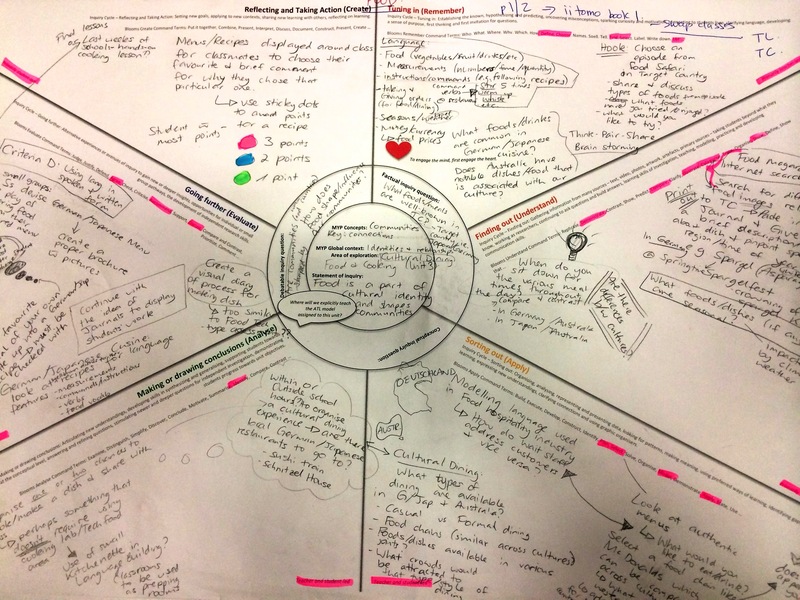 The collaborative circular planning tool is an initial start to developing as inquiry-based teachers and a common language across our College. This is simply a scaffold for inquiry that we have embraced as a College to help us develop as inquiry-based teachers and promote inquiry within our classrooms. As IB teachers we are encouraged to strive to take risks – developing as inquiry-based teachers is one way in which we can continually take risks in our teaching. Remember, this is just a scaffolding tool to plan for inquiry, there are many ways to plan for inquiry, this is just one way in which inquiry can be collaboratively planned for. I love this organizer! I notice that you are using Bloom’s…how would you add in DOK?